In the last few thousand years, humans have had a powerful impact on Earth. Within a geological blink of an eye, we exploded out of Africa to colonize virtually every inhabitable space on the planet. We dammed the rivers, we domesticated animals, deforested many areas, changed the chemistry of the atmosphere and the seas… the list goes on. But, what would happen if humans suddenly become extinct in the future? One may think “humans are so intelligent, so it’s very unlikely that the entire human race will be gone”. But, in fact, there is a strong chance that it will happen, and probably not in the long run! According to the the Global Catastrophic Risks Survey published by Future of Humanity Institute of Oxford University, placed human’s risk of extinction before the year 2100 at 19%! (see the video below published by Michael Stevens – the YouTuber known as Vsauce). If it seems unlikely and pessimistic to you, please read on (or watch the video). What would happen if humans became extinct? 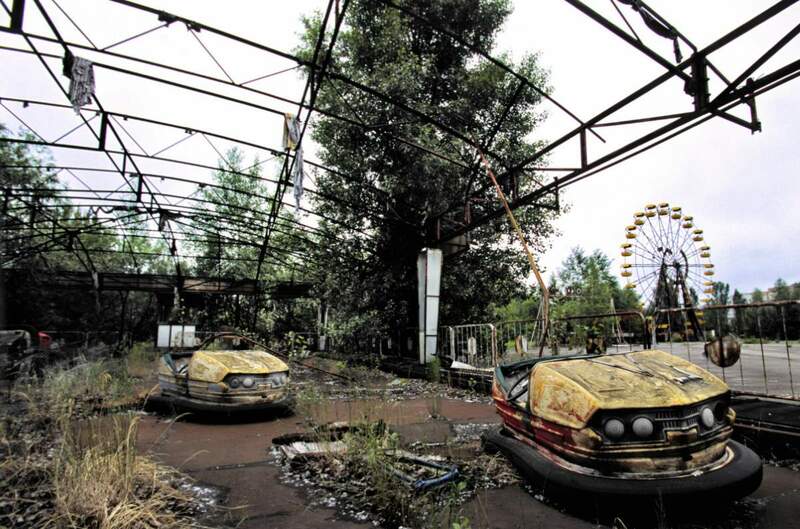 This photo gives some hints: the abandoned Pripyat amusement park, in Pripyat, Ukraine. It was to be opened for the first time on May 1, 1986, in time for the May Day celebrations, but these plans were scuttled on April 26, when the Chernobyl disaster occurred a few kilometers away. Imagine a giant urn that contains either 10 balls (numbered 1 to 10), or a million balls (numbered 1 to 1,000,000). You don’t know which is the case. And you are allowed to pull out one ball. You pull out the ball and it is the bull having number 4 on it. Which one is more likely, there are 10 balls, or a million balls in the urn? The answer is obvious. It is very, very likely that there are 10 balls in the urn. The probability of pulling out a ball that having number 4 on it from a set of 1 to 10 is 1/10. That chance is much smaller if we pull out from a million different numbers: 1/1,000,000. By analogy, think yourself as a numbered ball. You are a human who knows approximately what your birth number is – and it’s probably somewhere around 100 billion. That’s how many other humans were most likely born before you were. And you didn’t decide to get that number, it is “random” in nature. So, just like the number for a ball, you are a random sample from the set of all humans who will ever live. The “doomsday argument” points out that from 200 billion people, there’s 50% chance that a randomly chosen person like you will be born in the first one hundred billion. If there will be, let’s say, 10 trillion humans, that probability would be only 1% (the chance of any given human, like you, would happen to be born within the first one hundred billion). You were born in one of these green areas – in the first 100 billion or so humans. According to the Doomsday Argument, it is very unlikely that there will be 10 trillion humans in total. So, either you are very special to be born so improbably early in the story of humanity, or your birth number is to be expected, because there won’t be tens of trillions of humans. Human extinction will be sooner rather than later. Please keep in mind that there are many counter-arguments against the doomsday argument, which was developed by the Canadian philosopher John Andrew Leslie (born August 2, 1940). The argument was also independently discovered by John Richard Gott III (born February 8, 1947, in Louisville, Kentucky), a professor of astrophysical sciences at Princeton University and Holger Bech Nielsen (born 25 August 1941) is a Danish theoretical physicist, Professor emeritus at the Niels Bohr Institute, at the University of Copenhagen. To read about these arguments, see “Counter-arguments against the doomsday argument” section below. Human Extinction by vSauce. In the video, Michael also talks about the Doomsday argument. Anyway… Let’s return to the subject. What would happen if humans became extinct? The video below, published by AsapScience channel answers that very question. Billions of cows, pigs, chicken and sheep would starve, or get hunted by carnivores, including domesticated dogs and cats. But, in the long run, domesticated dogs and cats would be outcompeted by their wild counterparts, wolves, coyotes and wildcats. Animals and insects that depend on humans, such as rats and cockroaches would suffer drastic population declines. Most cities would be wiped out by fire. Streets would be overtaken by plants and trees. After 100 years all the humans are gone, most wood structures would be gone, and anything made of steel – from buildings to cars and bridge would follow them soon. Because without proper maintenance, steel quickly reacts with oxygen in the atmosphere and returns to its native form iron oxide, or rust. After a few hundred years, most species of animals, especially fish – at least the ones we haven’t driven to extinction would have bounced back to the levels at before human evolution. But their distribution would remain altered – like camels in Australia. It’s even possible that in some parts of the world, escaped zoo animals could form new wild populations – like lions on the Great Plains. North America plains. The chemical bonds hold together plastic or vulcanized rubber are immune to most of the digestive enzymes of bacteria. And unlike metals, plastics don’t rust or corrode. Hundreds of millions from now, alien geologists from outer space may be surprised to find sedimentary rocks full of tiny carbon-based particles that were once part of rubber tires or plastic bags. The magnetic radiation we created from our radios, satellites and phones will continue their journey forever. Maybe some extraterrestrial intelligence can learn once humans were existed somewhere in the universe, for a long time ago. Why would humans go extinct? This isn’t the subject of this article, but you can see the video below where Nick Bostrom from the Oxford University Future of Humanity Institute talks about the threats that our species face, and what we can do about them. Professor Nick Bostrom of the University of Oxford talks to Global Policy’s Dr. Jill Stuart about the possibility of existential threat and how academics and practitioners can begin to think about how to tackle these risks. Probability Theory and the Doomsday Argument by William Eckhardt (July 1993). Existential Risk Prevention as Global Priority: Nick Bostrom. Faculty of Philosophy & Oxford Martin School, University of Oxford.